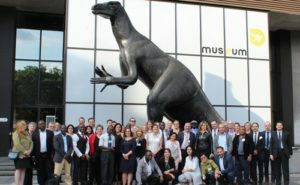 Geneva, 20 June 2018 – Over 80 participants representing 31 Parties, 6 Intergovernmental Organizations and more than 10 non-governmental organizations and academic institutions from Africa, Asia, Europe, Oceania and the Americas met in Brussels from 13 to 15 June to help design guidelines for the making of legal acquisition findings. These findings, which are one of the two fundamental prerequisites under the CITES Convention, require a legal verification by the Management Authority prior to issuing a CITES permit to the effect that the specimen was sourced and obtained in accordance with relevant laws and regulations throughout the value chain (in other words, legally acquired). Concepts such as the burden of proof, chain of custody, due diligence and risk assessment were discussed abundantly during the deliberations. Representatives from Austria, Belgium, Belize, Bolivia, Cameroon, China, Colombia, Costa Rica, Cuba, Democratic Republic of the Congo, Dominican Republic, Equatorial Guinea, European Union, Germany, Israel, Italy, Madagascar, Malawi, Mozambique, Namibia, Montenegro, Netherlands, Peru, Senegal, Slovakia, Spain, Thailand, Tunisia, United Kingdom, United States of America and Zambia exchanged their experiences during the three-day workshop. They discussed guiding principles, methodologies, practical tools, required documentation, forensic expertise, compliance risk assessments, legality verification systems and other legal resources needed by Wildlife/Forest/Fisheries Authorities to verify the legal acquisition of specimens of CITES-listed species to be exported. Although determining legal acquisition is a vital part of the implementation of the Convention, this was the first workshop dedicated entirely to the subject in the 43-year history of the Convention. Click here to access the full article. This entry was posted in Conferences, News, Seminar and tagged CITES, Institute for International Trade, wildlife. Bookmark the permalink.